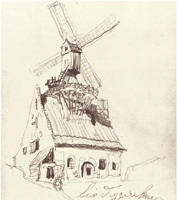 In our Meetjesland we have only two kinds of windmills: the older post mill and the more recent tower mill. Of course I'm not talking here of the modern steel monsters that cost a lot more energy to make than the piffling amounts they will ever produce. Without the huge government subsidies no one would build them. 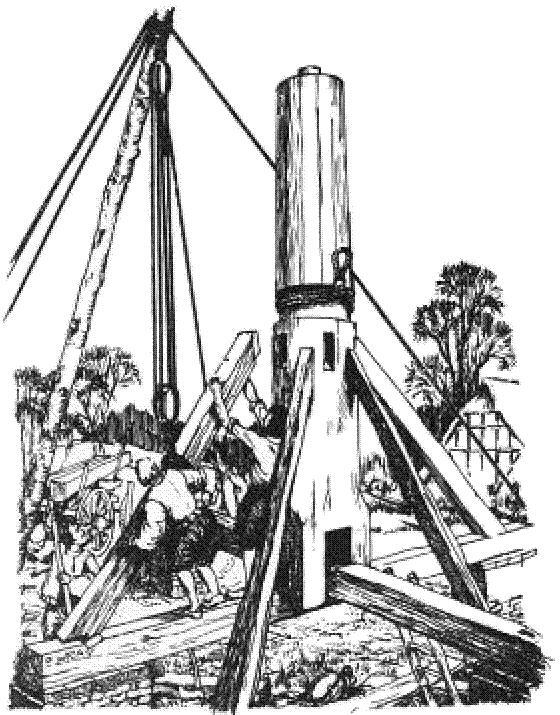 A post mill is litterally hung up on a huge central vertical post kept upright by four sturdy angled beams called quarterbars. The central post stands right in the middle of the "crosstrees", two horizontal timbers placed at right angles. At first these horizontal timbers were laid down on the ground but pretty soon they were put on piers because that way they don't rot quite so fast. In the drawing below we see some men standing on one of the beams of the crosstree putting a quarterbar in place. When all four quarterbars are in place the central post will be lowered so it rests squarely on the beams of the crosstree. a fine book by Mr. John Vince, first published in 1993 by Sorbus. The "trestle" is the foot of a post mill: the horizontal beams and the quarterbars that keep the mill upright. Of course the next logical step was to protect the trestle by covering the quarterbars and building in fact what is called the roundhouse. This had the added advantage of providing more storage room. that isn't round at all. To turn the sails to the wind for maximum efficiency the entire mill is built to rotate around the central post. The operation of turning the sails into the eye of the wind is called winding or luffing. This is what the tail pole is used for. It is a beam that comes down from the back of the mill almost to the ground and with this tail pole and some muscle power the mill can be turned. The tail pole is also a good place for a ladder to get into the mill. The wind turns the sails and thus the windshaft to which the stocks are attached. On the windshaft there is a first almost vertical gearwheel that turns a horizontal gearwheel that sits atop the shaft that turns the runner stone. These gearwheels were quite often made of applewood. Of course turning the entire post mill could be a somewhat cumbersome task and it obviously limited the size, weight and hight of a mill. The tower mill is a great step forward in windmill design: only the cap with the stocks is turned to face the wind; the rest is stationary. They were generally taller, roomier, sturdier and much more expensive than post mills. In our Meetjesland all tower mills are stone mills, quite often built on a hill. Since these mills are made of stone and since most of them are more recent more of them have survived. Most of the mills in our Meetjesland were grain mills: their raison d'etre in life was to grind grain. That grain is poured in the eye of the runner stone, the top stone which is turned by the mill. It is ground between the runner stone and the bedstone (the lower millstone that doesn't move) and of course the result is a quite warm mixture of meal and flour. Warm due to the friction. They can then pass this mixture over a fine mesh or canvas to separate the finer more powdery flour from the coarser grittier meal. Of course modern machines with their metal rollers produce a much more uniform kind of flour. We're not so sure that's what you really need, but there you are. Flourpower will sell you all kinds of meal and flour, all milled with unsubsidized windpower by the Artemeers Mill. Do yourself a favour and bake it yourself with Flourpower products ! Some of the pen pushing eurocrats want to restrict access to our heritage: according to their theory wind mills are dangerous. It looks like they want to push through a directive that would forbid access to windmills while they are running. A directive, that means our representatives won't get a chance to vote for or against. We had better put a stop to this nanny state meddling in ever more spheres of our lives. For those of you who read Dutch MOLENecho's tells us all about the 2799 existing wind and water mills in Belgium and a whole lot about more than 990 mills that have disappeared. This is a superb contribution to our heritage and we congratulate the webmasters Frans Ringoot and especially Lieven Denewet for a job well done. If you, dear reader, have information or a picture of a wind or water mill we encourage you to send it to them and they will update their database and website.